Douglas Adams originally created this book series as a radio series for BBC radio. The series was begun in 1978, and was first published as a book in 1979. 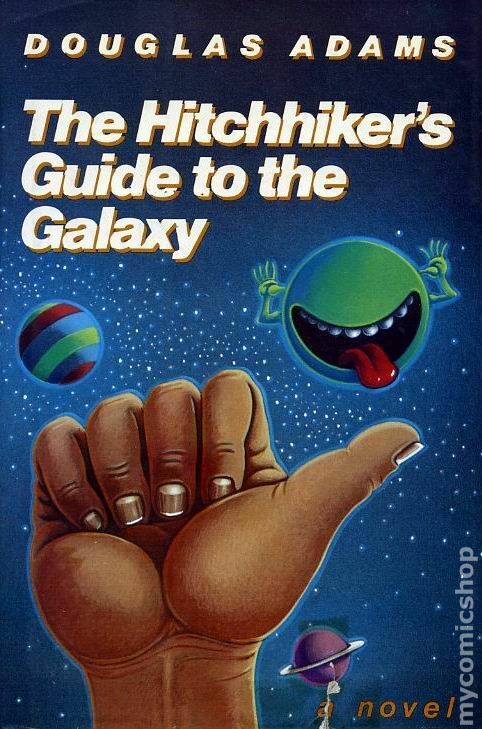 Despite the fact that Adams always referred to the Hitchhiker books as a "trilogy", it ended up being a set of 5 novels by the following titles: Hitchhiker's Guide to the Galaxy; Restaurant at the End of the Universe'; Life, the Universe, and Everything; So Long, and Thanks for All the Fish; and Mostly Harmless. This book starts with Earthling Arthur Dent facing the bulldozing of his house. This is due to occur in order to create room for a motorway bypass. Arthur's friend Ford Prefect comes along and tells Arthur three important things: 1) He, Ford, is an alien from Beetlegeuse; 2) He, Ford, is a writer for the Hitchhiker's Guide to the Galaxy, and 3) The Earth is about to be destroyed. Ford helps Arthur to escape with him on a Vogon ship. Unfortunately, the Vogons don't like anyone, and are particularly adverse to hitchhikers. Ford and Arthur are blasted into space to be picked up by Ford's cousin Zaphod Beeblebox. Zaphod and his earthling girlfriend - a woman Arthur once met at a party - have stolen a spaceship called the Heart of Gold. This ship runs on an improbability drive, meaning that when a button is pushed, the most improbable thing will happen. Zaphod and Trillian are using it to try to find Magrathea, which (according to legend) was once the richest planet in the galaxies. The group do get to Magrathea and are attacked by an ancient weapons system. Once again, the improbability drive saves them, and they land on the planet and start to explore. Arthur meets a guy by the name of Slartibartfast who tells him that the planet was home to the most intelligent computer of the all time. The computer was built by the inhabitants in order to find out the answer to the question of Life, the Universe, and Everything. The computer, after telling the waiting crowd that the answer was 42, commissioned the building of Earth in order to search for the actual question. Earth was destroyed by the Vogons, however, just before the question was found. The descendants of the creators of the computer, two mice, want to take Arthur's brain to look for the answer, since he was on Earth just before it was blown up. Arthur is saved by the gang and they all leave Magreathea on the Heart of Gold, heading to the Restaurant at the End of the Universe for some food. This page was last modified on 17 January 2018, at 19:39.